Welcome to the Captain Suite, Koh Tao Coral Grand Resort, Koh Tao, Surat Thani, Thailand. With a superb view of the Sairee beach, the 3 beautiful Captain Suite's, Koh Tao Coral Grand Resort, Koh Tao, Surat Thani are available at our resort. Each covers 76 square meters and contains 2 bedrooms, and all chalets are set by the swimming pool side. 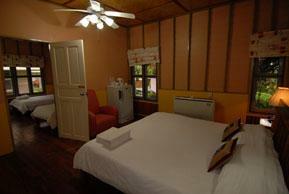 Each air conditioned room is embellished with a polished coconut wood floor and Thai style bamboo ceilings. The master bedroom has a King-sized bed with separate bathroom, containing a bathtub and a hot water shower. The second bedroom contains twin bed with a separate bathroom as well, also with a hot water shower. If that were not enough to appease the luxury-living customer, a balcony, wooden cooling fan, satellite TV, telephone, mini-bar, refrigerator, hair dryer, tea and coffee are all featured in the chalet.